Any community contributions to libgdx go here! Some may get included in the core API when permission is granted. In the last video you said : "Why can't I come up with these ideas on my own". So here is one for you: Would be great if we had VisUI support for previews. I think there are lots of people using it, so it would be a try worth. I believe most people use VisUI for the default skins it's packaged with. In any case, I would have to refactor the entire project first before I can accommodate such an addition. I'll keep it under advisement though. Thanks for the suggestion. Join us on Discord for faster and friendlier service. 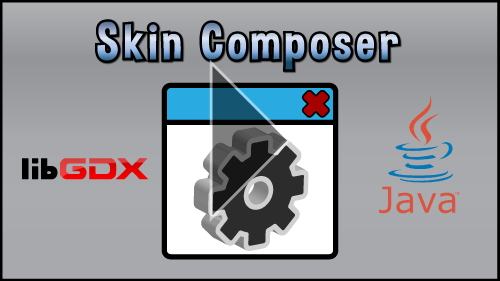 Create skins visually with Skin Composer. Version 19 available for download. * Fixed locale error causing crash bug in the FreeType dialog. * Fixed crash with font in custom class when rendering table. * Fixed export not acknowledging custom class with font set to a FreeType font. Version 20 available for download. * Added ImageFont dialog to create Bitmap Fonts from images designed in an image editing software. See video. * Updated UI to use FreeType font. * Fixed FreeType fonts not loading correctly from SCMP file. * Fixed FreeType font selections in custom classes not saving with SCMP file. * Fixed editing FreeType fonts removes them from custom classes. Version 21 available for download. * Fixed blending issue causing white fonts to have dark outlines in Image Font. * Automatically suggest target file name in Image Font. Version 22 is available for download. * Added setting to check for updates. Update button appears on top right of main screen. * Added dialog to create Bitmap Fonts as an alternative to Hiero. * Fixed imported skin files having darkened transparent images. * Added preview bg color setting for Image Font dialog. * Temporary files and program settings are now saved in folder ".skincomposer" of the user's home directory. * Added Windows installer and file associations for ".scmp" files. * Improved layout and applied fixes to FreeType dialog. Version 23 is available for download. * Added 9-Patch Editor. See Project >> Drawables >> Create 9-Patch. * Fixed crash bug when adding a drawable after creating a custom drawable. * Fixed crash bug when saving a project with relative paths and a FreeType font with no custom serializer. Version 24 is available for download. 1.9.9 features are only compatible with LibGDX 1.9.9-SNAPSHOT and later versions. * Updated to LibGDX 1.9.9. * Added setting for export with simple names per 1.9.9. See Project > Settings. * Allows import of 1.9.9 skins with simple names. * Added a parent setting to each style to support 1.9.9 cascading styles. Selectable parent options respects class inheritance. * Resolved issue with Create Bitmap Font dialog creating fonts with incorrect baseline values. * Resolved drag and drop broken after using Create Bitmap Font dialog. * Added drag and drop to Create Bitmap Font and Freetype Font dialogs. * Fixed SplitPane preview not allowing for adjustments. * Added indent spacing and tied missing properties to the Tree preview. * Prioritized nine patches over standard graphics when images of the same name are dragged into the Drawables dialog. * Auto zoom and recenter in Nine Patch Editor now considers width in addition to height. * Resolved auto patches not functioning correctly for fully opaque, single-colored images in Nine Patch Editor. * Added save/load settings for bitmap font and Freetype Font dialogs. * Added check for preview fonts upon project load. * Added option to change preview background color in Nine Patch Editor. * Added option to change preview background to bitmap font and Freetype font dialogs. * Improved appearance of handles in Nine Patch Editor when zoomed out. * Fixed crash when trying to move handles in Nine Patch Editor when no image is loaded. * Resolved update button disappearing when a new project is started. * Replacing a drawable with a new drawable no longer breaks the link with styles using the original. * Proper replacement of custom drawables with a standard drawable. * Replacing a drawable no longer deletes tinted drawables based on that file. * Fixed crash when viewing fonts with multiple images after importing skin on an unsaved, new project. * Added UI support for ISO-8859-1: Western European and ISO-8859-2: Central European. * Fixed characters select box value incorrectly set when editing a Freetype font. * Fixed "duplicate custom class" creating an extra default style. Our games and website: https://www.unlimitedggames.com/. No problem! It didn't stop a new bug from creeping in though. I uploaded a new version (version 25). * Fixed exception when opening an old project. * Improved error message when trying to add a font that is too large for the texture settings.